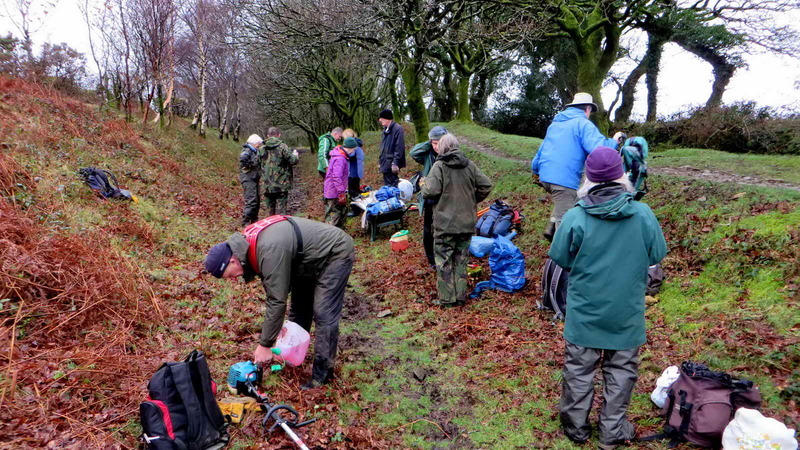 Thursday 4th February 2016 saw twelve DPA volunteers gathering in the car park at Clearbrook from where we made our way to the spot at which we originally started the Devonport Leat project. We carried some tools by wheel barrow, as we did some years previously. We started work not quite where we did originally because today we started at the tunnel exit, originally we started at the tunnel entrance (photos below), on 2nd Sept. 2011. We reached this point during the course of today’s work. We had some discussion today about the leats and their history. Links to their origins etc. can be found via this web page. Two photos showing “before” and “after” today’s work ….. 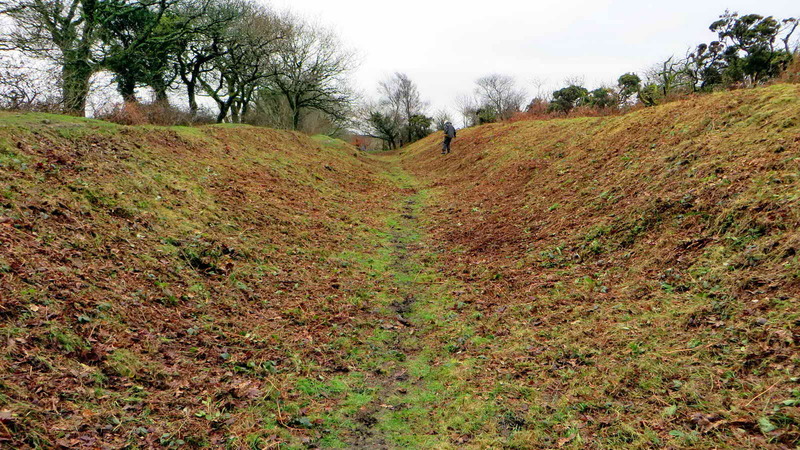 The photograph below reminds us how the tunnel roof area, between the two embankments, looked before we started working here ….. the footpath on the top of the south embankment is seen to the right of the photograph – there was no point going down between the embankments to take a photograph! 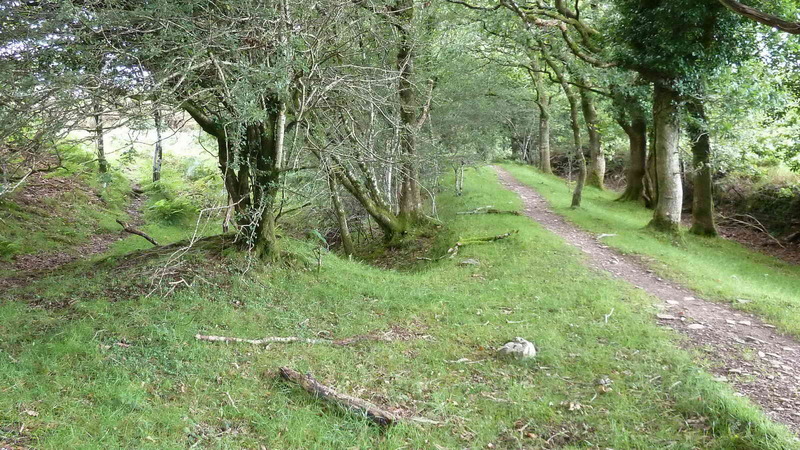 The view before clearance work started in Sept. 2011; looking towards Yelverton. After a short session of organising who does what …..
Getting “sorted” prior to starting the work. 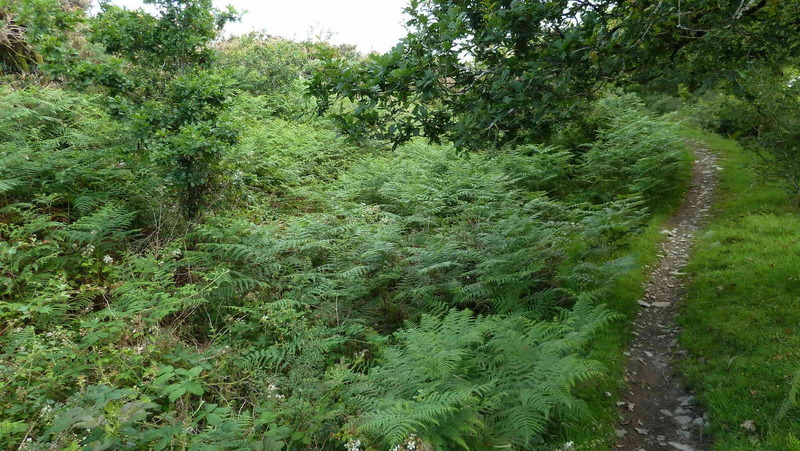 We began the task of removing regrowth mainly of bramble, mixed with dead bracken. 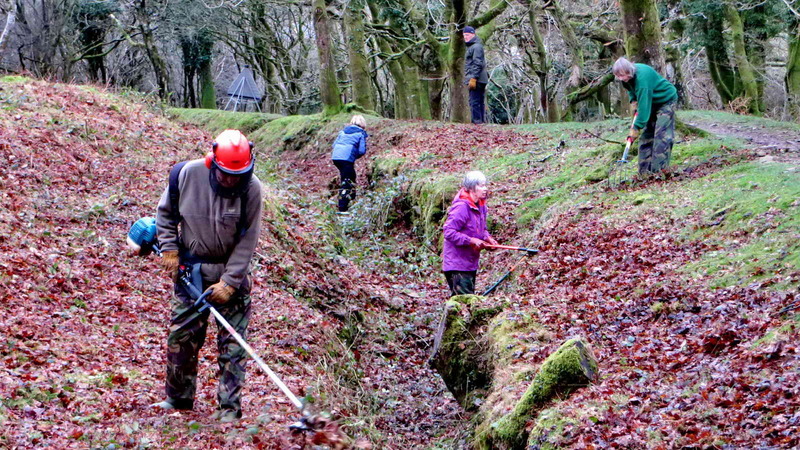 Today’s volunteers were Chris Francis, Claude Williams, Derek Collins, Elaine Viant, Hilary Luce, John Viant, John Watson, Keith Ryan, Rachel Watson, Stephen Barrow, Sylvia Hamilton and Val Barns: 12 volunteers in total. Elaine kindly brought two cakes: Ginger and Honey – both rather nice. 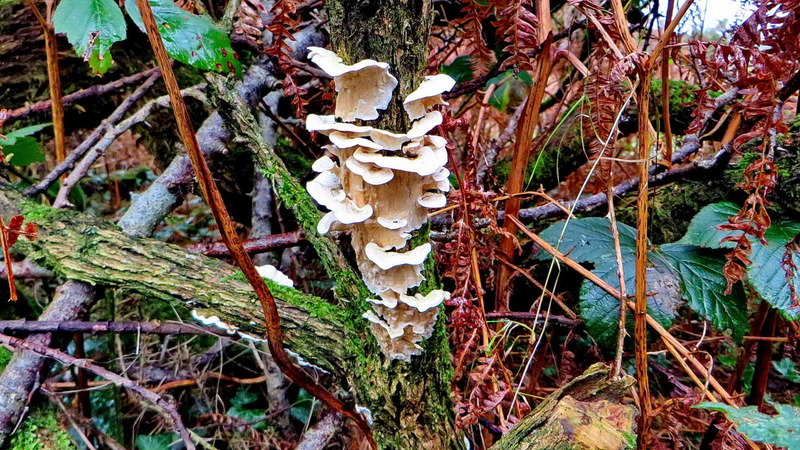 Unidentified white fungus, growing on gorse …..
Closer view of the fungus, from below. 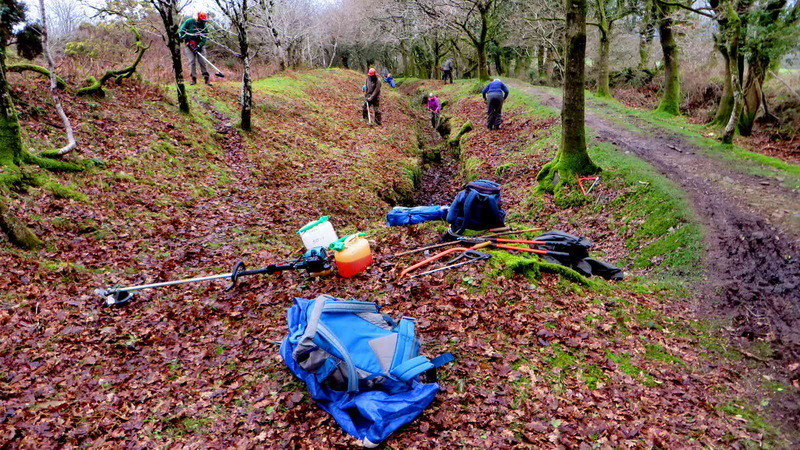 Some cutting is done by hand, using loppers and some volunteers bring their own “hooks” or sickles, but most is done by brush-cutter ….. The photos above show work on the roof of the tunnel that the leat flowed through when it was running. 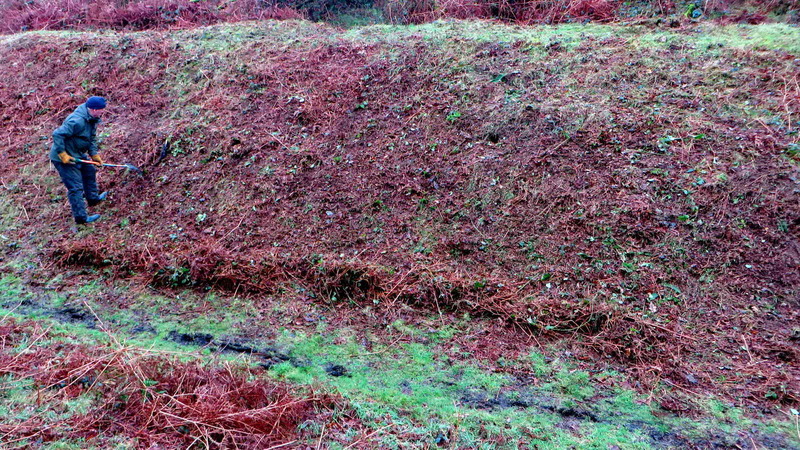 The reason for covering the leat was ostensibly to prevent bits of tree and animals from falling into it. View from the roof of the tunnel entrance, looking towards Yelverton. DPA volunteers doing what DPA volunteers do! 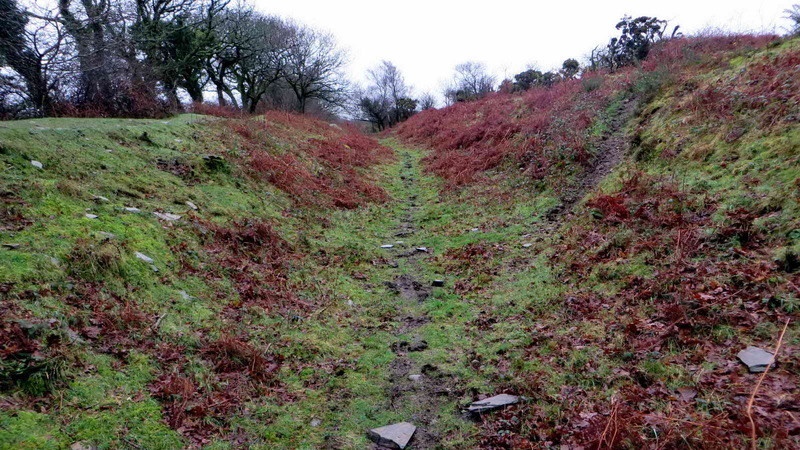 The photograph below is truly a “before” image ….. Standing on the roof of the tunnel entrance in Sept. 2011. 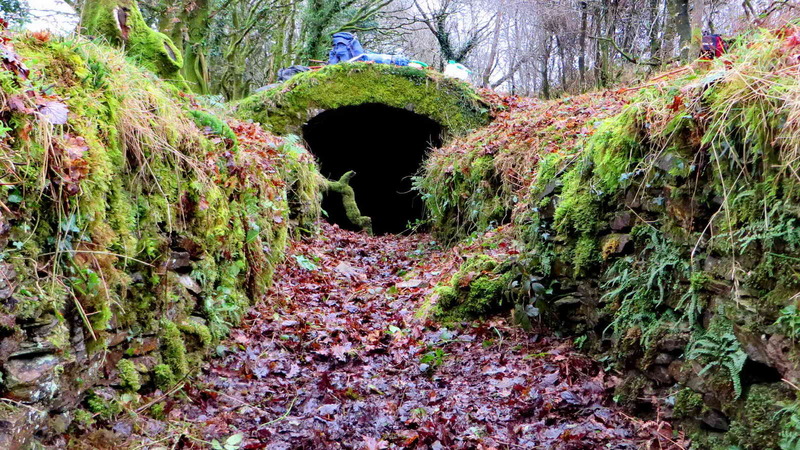 Devonport Leat tunnel entrance – a low angle view. 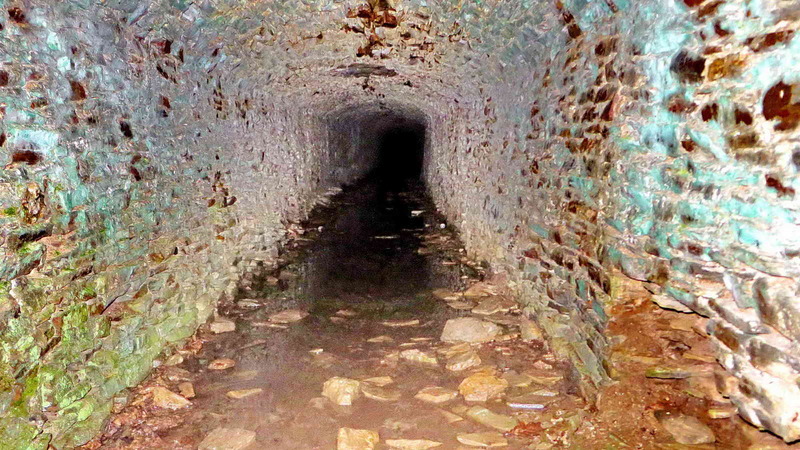 The leat contained a little water and this was also true just inside the tunnel. A journey through the tunnel can be seen here. 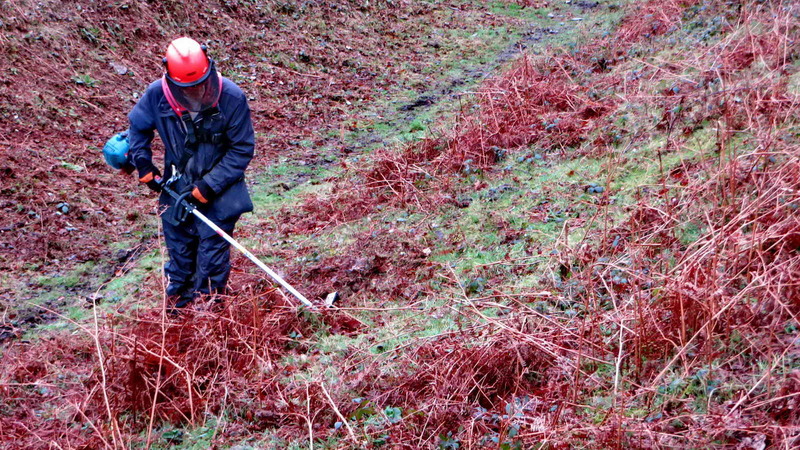 The length of leat cleared today was 261 metres (285 yards). 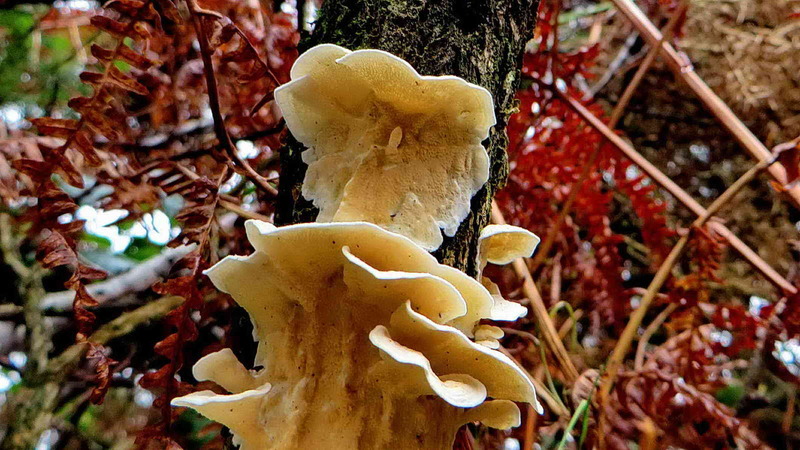 Interestingly, we saw a wasp today and a song thrush was heard singing – Spring must be almost here.